I pick up each angel figurine and run my dusting cloth gently over their wire wings and unpainted faces. Before putting them back I study every one, my heart remembering when they were given and why. An angel embracing a child commemorates the first anniversary of my mother’s death. Holding a single rose, an angel with upswept hair speaks of my husband’s love. There are angels holding a book, a cat, a bird and a golden ball, representing different aspects of my life. Two angels have praying hands, given by recipients of my prayers. A little boy angel holds a balloon aloft which says “hope”, gifted during a cancer journey when hope was hard to come by. 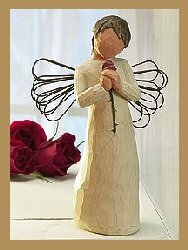 Why do these angel figurines, representing significant times and people, evoke poignancy, melancholy, even sadness? I think it has to do with the way I love. I truly give my heart away to those who call up love in me. So when life inevitably changes, a piece of my heart is left behind in those circumstances. Even when those I love are still in my life, relationships change and I find myself longing for how it used to be. The fact that nothing stays as it is creates a hollowness in my soul, a restlessness stirring up yearning sighs from deep within. Slow to remember how to respond to this vague longing, I drift through my day, not able to settle on anything useful. When I finally open a well-thumbed book beside my chair and read, the hollow places gradually fill up with precious words about One who is able to satisfy my longing for perfection and permanence. These words tell me of the One who offers Himself as the perfect soul food so I will never go hungry, and the perfect spirit drink so I will never thirst. I keep reading to fill up with His promises to never leave me or forsake me, to be the same yesterday, today and forever, to prepare a place for me with Him in heaven. In these pages I find the Person who completes all my heart’s unfinished business. Jesus occupies my inner space so if there are hollows or lack, it is because I have taken my eyes off Him. I can’t afford to do that so I read on. When I finally put my Bible down, my eye catches the upturned face of one of the little angels on the shelf. I can almost imagine her shaking her head at me for taking so long to figure how to assuage my longing. Life relationships and circumstances will always be fluid, shifting from intimacy to distance, from love to loss. I am grateful for people who have enriched my life, even for a short time, and for those who are committed to walk the rest of the way with me if they can. I’ve given them a piece of my heart which may well be trampled on or lost. I understand that. But the rest, peace and permanence found in Jesus Christ is the only completely reliable truth for my life now and forever. I hope it won’t take me until my angels are dusty again to remember where perfection lies.